Browse: Home /	Community Building, Events, LIVABLE STREETS, Public Places, Sustainable Flatbush News / Park(ing) Day 2011 at Cortelyou Library Plaza! Join us for Park(ing) Day this Friday September 16th! 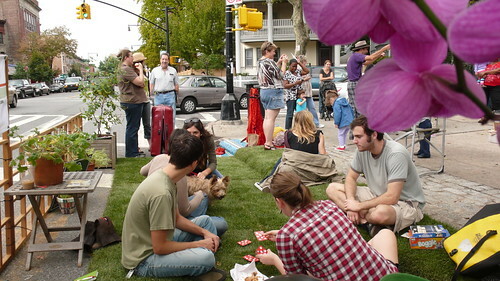 Every year since 2007, we’ve transformed the same parking space on the corner of Cortelyou and Argyle Roads in Brooklyn into a public park (with real grass!) and day-long festival on Park(ing) Day. Park(ing) Day is an annual international event where citizens, artists and activists around the world collaborate to temporarily transform parking spaces into “PARK(ing)” spaces: public places for a day. This year Sustainable Flatbush will celebrate our success in turning the vision of PARK(ing) Day into a year-round reality! We’ve created a partnership with the newly-formed group Friends of Cortelyou Library and NYC Department of Transportation to install benches and planters in front of the library so it can serve as a permanent public space for relaxation, reflection and friendship. 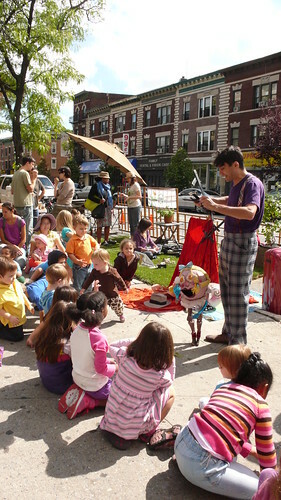 Park(ing) Day 2011 will feature activities for all ages including a puppet show, live music, art projects, a writing workshop, and even a hula hooping class! We’ll present information about our projects in the neighborhood and interactive workshops on how to live more sustainably in the city, with topics such as composting, gardening with native plants, renewable energy with the SunBike (before it heads off to Maker Faire for the weekend!) and more! The mission of PARK(ing) Day is to call attention to the need for more urban open space, to generate critical debate around how public space is created and allocated, and to improve the quality of urban human habitat. For four years we’ve brought this discussion to the heart of Brooklyn by creating Cortelyou Road Park in front of the Cortelyou Library. The library’s plaza had no seating or other amenities, but since 2007 our temporary park has spilled into the plaza and transformed it into a vibrant urban oasis on Park(ing) Day. Park(ing) Day is an opportunity to create a community gathering place, and to make a statement about how we utilize public space. In our neighborhood, despite all the beautiful homes and lawns and gardens, the amount of publicly accessible green space per person is much lower than the city average*. On Park(ing) Day we take 160 square feet of concrete that would normally be occupied by one automobile, and transform it into something magical that is enjoyed by hundreds of people, a place where neighbors can interact and build community. Stop by on Friday September 16th to celebrate the newly revitalized Cortelyou Library Plaza with us! Check here for the day’s events schedule. If you’d like to volunteer for this event, please email us or call 718-208-0575.